South Korea is a vibrant and energetic country with a lot to offer visitors. If you're a budget traveler, backpacker, or student, there are some good hostels throughout the country that offer fun and affordable places to stay in any number of cities. 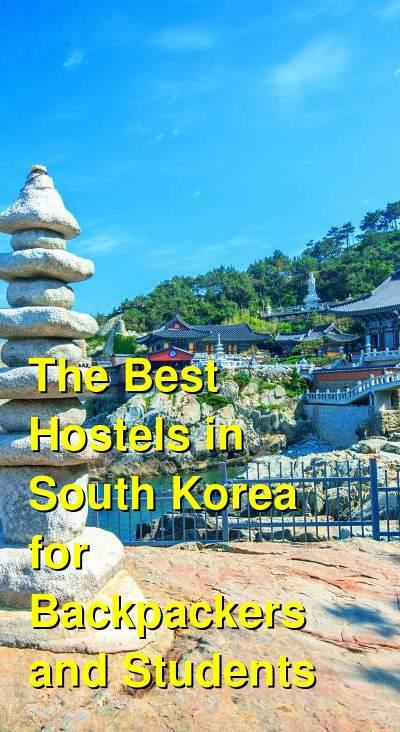 Although hostels aren't as common in South Korea as they are in many Asian countries, there are still enough around to offer a diversity of options. This is particularly true in the most popular tourist cities. How much do hostels in South Korea cost? An affordable and safe hostel for backpackers and students in Seoul, South Korea. Backpackers Inside is a great hostel for budget travelers to Seoul, South Korea. The hostel is located in the middle of Daehangno, which is a historical, cultural, and shopping district in the city. The area is easily accessible with public transit and there is plenty to see and do in the area. Whether you're looking for a social place to stay where you can meet other guests, or a comfortable and relaxing place where you can have some space to yourself, this hostel is a good option. There are a wide variety of private rooms available that sleep anywhere from one to seven people. There are also dorms that sleep five or eight people and are split by gender. The hostel also has a shared kitchen available that guests can use as well as a common room where you can hang out and socialize. An affordable and safe hostel for backpackers and female travellers in Busan, South Korea. The Wendy House is a great option in Busan, South Korea. The owner, Wendy, is wonderful and goes out of her way to help you with your visit. The hostel has the feel of a home away from home and there are many great amenities available for guests. There's wi-fi available as well as security lockers. There's also a nice roof terrace that looks out on the Diamond Bridge. In the morning, there's a filling breakfast available that is perfect for starting your day off right. The hostel has dorms that sleep four or six people. Male only, female only, and co-ed rooms are all available. A good option for backpackers, solo travellers, and small groups of travellers on Jeju Island. Jeju Hiking Inn is a favorite place to stay for backpackers and budget travelers to the area. The building is located in Seogwipo City and looks out on the Seogwipo Harbor. The prices are quite reasonable and the staff are very friendly and helpful. The hostel has all of the standard amenities available including free internet access, wi-fi, a roof top lounge, and laundry service. There's also a shared kitchen that guests can use, bicycle rental, and all kinds of travel information. The hostel has four bed dorms available that are split by gender. There are also a wide variety of private rooms that include singles, twins, doubles, and family sized rooms. A quiet and safe option for backpackers and solo travelers in Gyeong-ju, South Korea. Coolzaam Guesthouse is a favorite place to stay if you're traveling on a budget. The staff really go out of their way to make sure you have everything you need. They understand the challenges that can come with the language barrier, and will help you with any reservations or recommendations you might need while you're in town. The guesthouse is centrally located and makes a good base for exploring the area. It has a cosy atmosphere and a shared kitchen where guests can prepare their own meals. There's also wi-fi and a computer which guests can use. The guesthouse has dorms the sleep four or six people. There are also twin and four bed private rooms available if you want a little more space and privacy. An affordable hostel for backpackers and hikers in Sokcho near Mt Seoraksan National Park. The House Hostel is a very welcoming and comfortable place to stay in Sokcho. It's an affordable option for budget travelers and is just a short walk from the Sokcho Intercity Bus Terminal. Mt Seoraksan National Park is about a half hour bus ride away, so this is a great place to base yourself. The hostel includes all of the standard amenities including breakfast every morning and a shared kitchen that guests can use. There's also a nice common area where you can hang out with other guests. The dorm rooms sleep up to four people and are split by gender. There are also single, double, and three bed private rooms. An affordable and safe hostel for backpackers and solo travellers to Yeosu, South Korea. Backpackers in Yeosu is a good option in Yeosu. It's conveniently located near the main train station and there's a bus stop right in front of the building. This is a safe and secure hostel with lockers available in the dorms. There's a living room area where guests can hang out and watch television. There's also a kitchen with a refrigerator and microwave. If you want a traditional Korean meal, there's a restaurant located on the first floor. If you're looking for a comfortable and affordable place to stay in Yeosu, then this is a good option. A quiet, safe, and affordable hostel in Daegu, South Korea. Danim Backpackers is a quiet and comfortable hostel in Daegu, South Korea. It's located near some good bars and restaurants and it makes a nice base for exploring the city. The hostel is near the subway and is walking distance to some great nightlife. There's also a supermarket nearby where you can pick up some food to prepare in the shared kitchen. Laundry service is also available. The hostel has a variety of amenities available for guests including security lockers, wi-fi, and travel information. There are dorms available that sleep up to six people, and female only rooms are available as well. A quiet and safe hostel for backpackers and students in Gwangju, South Korea. If you're looking for a quintessential hostel where it's easy to meet other travelers and just hang out, then Pedro's House is a good option. It's located in the middle of Gwangju, and the hostel makes a great place to base yourself while you're in the area. The atmosphere is friendly and welcoming, and it's quiet enough that you can enjoy a good night's sleep. There are four bed dorms that are split by gender, as well as double and three bed private rooms. There's a nice cafe where many guests enjoy hanging out and getting to know each other. Every morning breakfast is served with juice, coffee, and tea. If you're looking for a relaxing and genuine experience while you're in South Korea, then a stay at Pedro's House is an excellent option.